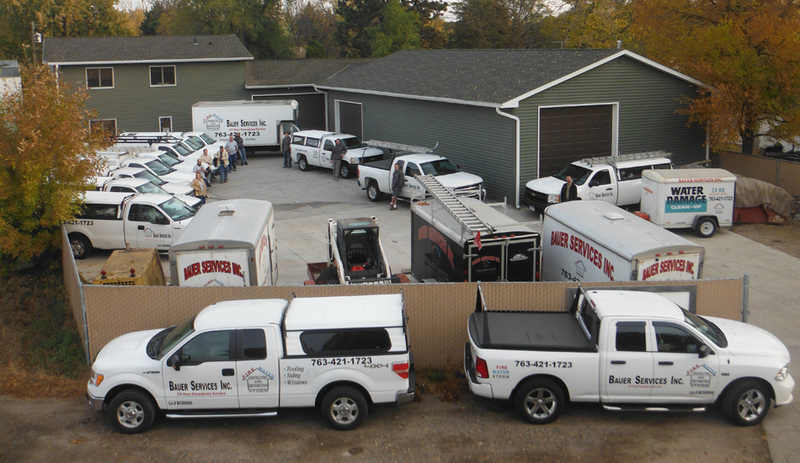 Bauer Services, Inc. is a locally owned and operated business with over 50 years of combined experience. Our professionally trained and certified technicians will provide quick service to any fire, storm or water emergency. Tim Jones, Jerry Borg and Kevin Sax are the founders of Bauer Services, Inc.
Our founders' combined experience spans 50 years, bringing unparalleled expertise to the construction and restoration industry. Bauer Services employees have received specialized training in the mitigation and restoration of properties that have been damaged by Fire, Water, and Storm. Bauer Services, Inc. is a certified restorer through RIA International, and is a licensed builder in Minnesota (Lic.# 20508666) and Wisconsin (Lic.# 1002167). We specialize in all aspects of restoration, including but not limited to: securing properties after an event, estimating project cost, managing projects to their completion, and the reconstruction of projects which includes taking inventory of personal property, demolition, full construction services, and post-construction cleaning. We are confident that you will be fully satisfied when we have completed the reconstruction of your home or business. Our sincere thanks for all the work that was done at our house. We have been so pleased with the quality of the work and the workers. They all did excellent work but they were also personable and kind. Thanks so much for all your help with our basement. It was so nice to have it all done so quickly!! … Thanks for taking such great care of us. Thank you to you and your people for all the work that has been done to put our house back together again, better than it was before. Thank you for caring and going the extra mile – more than the extra mile. Thank you for ‘taking care’ of our policyholders. Bauer Services seems to recognize the personal factor. I consistently get great feedback from policyholders about how compassionate you and the guys are. Today [the homeowner] said that someone with Bauer was kind enough to call her to let her know that demo was starting. He told her that if they found any photos they would be set aside for her. While this made her cry, she said that it was another example of how great the people involved in the process are. My Wife and I are very pleased with the work done to restore our home after the furnace went out, pipes froze and then burst with water damage throughout the house. Bauer Restoration worked very hard to restore our home to a state of equal too or better than our home was before the damage. I would have no reservations about recommending your organization to any other homeowners with damaged property especially homeowners with water damaged property. Bauer Services was terrific to work with. Our project manager, was professional, punctual and was genuinely interested in taking care of the water leak, as well as discovering the root cause. The gentleman that did the work was also very professional and hardworking, He always left my home neat and clean, making sure that nothing was left out or in the way. He did a very nice job restoring everything to the way it was BEFORE the leaks. I would definitely recommend Bauer to anyone needing home repairs. Bauer Services works with all major insurance companies.